Each year for four days in October, the streets of Akko play host to one of Israel’s leading cultural events--The Akko Festival of Alternative Israeli Theatre. 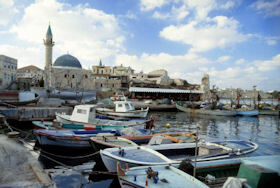 Akko is a mixed city of both Arabs and Jews, and the festival includes both Hebrew and Arabic plays and Jewish-Arab co-productions. It attracts people of all ages from all over Israel and is full of fringe theatre shows, colorful street events, and street theatre performances. Sounds exciting! me-od meragesh! At this year’s festival, Jonathan got to see Eran in a fantastic production. He was so impressed that he invited Eran’s acting partner, Elad, to join our lesson and give us an encore performance. 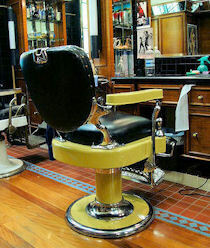 The barbershop scene from their play is full of verbs in a brand new building block . . . so not only will we get to meet Elad, we’ll also get to meet hitpa-el! Eran and Elad will give us a very helpful review of the Hebrew building block system. We’ll recognize again why pa-al is called pa-al, and we’ll learn why hitpa-el is called hitpa-el. All of this . . . plus some free theatre! Who can top that? So join us, and you’ll agree . . . Learn Hebrew Pod shiur mispar esrim ve-shmone deserves a standing ovation!